In the recent business trends, business to business website is earning high profit. 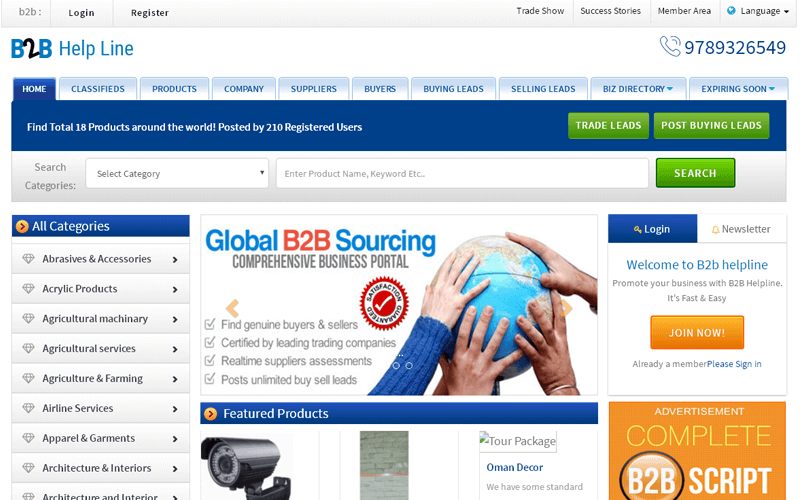 So start your own online b2b website business by using our B2B Marketplace Software. Our Business to business marketplace script connects small and medium-sized buyers and sellers from all over the world under your own domain. This Ioffer Clone Script consists of many categories such as Auto & transportation, Electronics, Gifts, sports & toys, Beauty & health, Glasses, Education & training, food & beverage and more on. The sellers can upload their product /services in the respective category and subcategory with the detailed information such as image, title, description, minimum & maximum price, and features. Besides, that supplier can add their product quotation and the buyers can directly message the sellers. So that the sellers can get leads easily this will help the revenue process.The sellers in the Ecplaza Clone Script can manage the selling of their products/services easily through their dashboard. The buyers can easily purchase the products in our script easily. The revenue model of the script for the website owner are membership commission, banner ads, Google advertisements such as text ads, image ads & video ads, affiliate ads and more on. The features of our Diytrade Clone Script are user management, product management, advanced admin dashboard, attractive buyers & sellers dashboard, contact/message suppliers, easy search option, extensive product searching & sorting, trading statistics, send quotations, social media integration, CMS page, success story,newsletter, trade show, multi-language, buying and selling lead management, manage uploads products and more on. Through the dashboard, the admin can manage various modules such as categories, subcategories, products, buying leads, location, slider images, cms page and more on.The code of the Diytrade Script is optimized according to the Google standard, so our script code is highly secure and safe to use. The client can customize our script easily with their requirements and business concepts. The main two features of B2B Marketplace Software are SEO friendly and mobile responsive. There are mainly five membership plans are available in our scripts such as premium, corporate, diamond, platinum and gold rush. Each membership plan has the different features. Phpscriptsmall provides 1-year technical support, 6-month free update of the source code and brand free, after purchasing the script, the website will be live within next 24 hours. We are the leading website Clone Company since 2015, we offer different types of readymade PHP Clone Script to the clients at best price. We have clients all over the world. Ease of installation and use I’m extremely happy. I’ve find out so many script for building my website and finally decided to use this script . It’s excellent an script. The installation and documentation helped me on how to install the script . I strongly recommend everyone to PHP Mall Script .